On September 5-6, 1864, 150 years ago today and tomorrow, the 3rd New York Cavalry patrolled the area outside of the pickets of the 1st District of Columbia Cavalry. The 1st DC Cavalry was actually facing south and manning a picket line from Sycamore Church to Cocke’s Mill a few miles south of City Point and the James River. Dismounted Confederate cavalrymen of Barringer’s North Carolina Brigade, and perhaps others, had been harassing the 1st DC Cavalry’s picket line looking to find a mount and avoid infantry service. After repeated attacks, the 1st DC Cavalry had asked for some help. 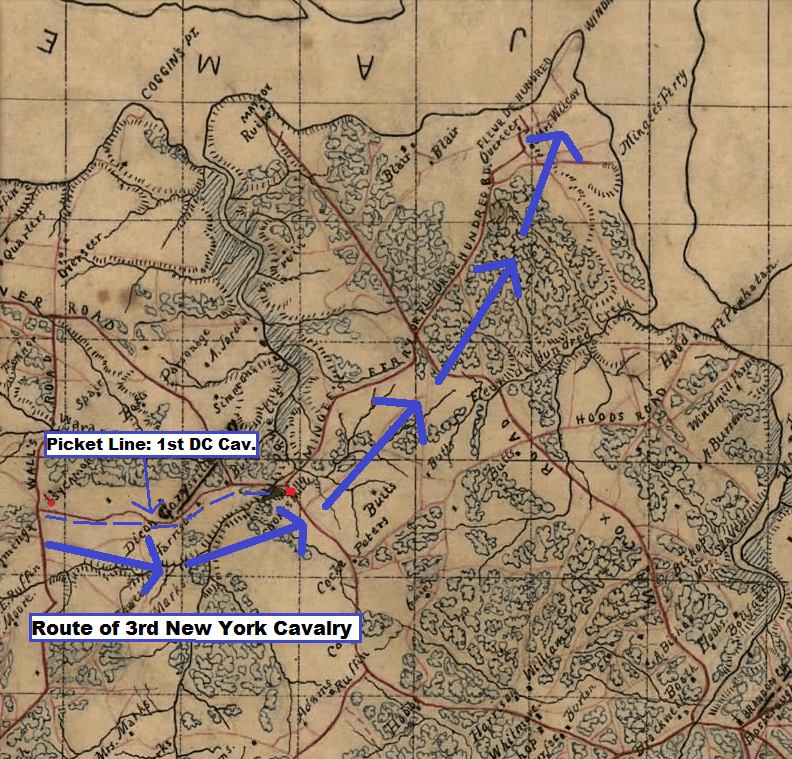 In response, General Gregg sent the 3rd New York Cavalry under Colonel George W. Lewis on a reconnaissance mission across the front of the 1st DC Cavalry. The 3rd arrived at Sycamore Church as night fell on September 5, 1864. At daybreak on September 6, he proceeded east from Sycamore Church to Cocke’s Mill, and then northeast to the James River near Wilcox’s Landing and Fort Powhatan. The recon mission was a giant fizzle, as Lewis managed to find only five Confederates southeast of Sycamore Church, and they managed to elude his grasp. A dispatch from the lieutenant-general commanding armies in the field states that Colonel Spear reports that the enemy made his appearance at several points between Sycamore Church and Cocke’s (Cox’s?) Mill this morning, and directs that a brigade of cavalry be sent there immediately to drive what force the enemy has there completely off. The commanding general directs that you send the force named and for the purpose designated. The additional regiment sent there yesterday should count as part of the brigade. The reports from the pickets report everything quiet along the entire line. The commissary sergeant of the First North Carolina cavalry got hit and surrendered himself on the right of my line this morning. From him I learn that the parties who have been molesting my line are parties of dismounted cavalry seeking to remount themselves to save being transferred into the infantry. His regiment, about 500 strong, he reports as on picket, their left extending to the plank road and the reserves near the railroad near Ream’s Station. He says the regiment has been on picket now for two days. In obedience to the general’s orders I have directed Colonel Lewis, of the Third New York [cavalry], to proceed with his regiment to Sycamore Church to reconnoiter the front of the line in that vicinity, and to endeavor to capture or drive off such parties of the enemy as he may find, and to require the assistance of the First District of Columbia [cavalry], if necessary, to assist him. The general commanding [Kautz] directs me to inform you that Colonel Lewis, commanding Third New York Cavalry, has been ordered to drive or capture whatever force of rebels he may find between Sycamore Church and Cocke’s Mill. He has been authorized to call on Major Baker [of the 1st D.C. Cavalry] for re-enforcements (whom you will please notify), but not taking any of his men from their present position on the picket-line. He also desires me to inform you that the commissary-sergeant of North Carolina regiment captured this morning reports that the men who attack our pickets are dismounted cavalrymen seeking to obtain horses to remount themselves so as to avoid doing infantry duty. Such men, if captured, are not to be sent in as prisoners. Major: I learn from the commanding general [Kautz] that Colonel Lewis’comand, Third New York Cavalry, has been ordered to drive or capture whatever force of rebels he may find between Sycamore Church and Cocke’s Mill. He has been authorized to call upon you for re-enforcements, which you will furnish if required, but not take any of your men from their present position on the picket-line. I learn from headquarters that a commissary sergeant of a North Carolina regiment reports that the men who attack our pickets are dismounted cavalry seeking to obtain horses to remount themselves so as to avoid doing infantry duty. Such men, if captured, are not to be sent in as prisoners. Colonel Lewis, Third New York Cavalry, reports that he found today but one small party of the enemy, five in number, in the region about Sycamore Church and Cocke’s Mill. In the Field, near Prince George Court-House, September 6, 1864. CAPTAIN: I have the honor to report that, in pursuance of orders received from your headquarters yesterday afternoon, I proceeded with my command to Sycamore Church. Arriving at that point after nightfall, I bivouacked. At daybreak this morning I proceeded to reconnoiter the ground in front of the First District of Columbia line of pickets, between Sycamore Church and Cocke’s Mill, and two miles on the left of the line from Cocke’s Mill toward Fort Powhatan and Wilcox’s Landing. I saw nothing of the enemy except at a point one mile to the left and two miles in advance of Sycamore Church, where five mounted men were discovered. They took to the woods and I was unable to find them. I arrived back to camp at 1 p.m.
Captain: I learn that about sunrise this morning several rebel soldiers were seen near Doctor Bryant’s house. A few were mounted. I have just returned from a visit along the right of the line. There is a safeguard named Gay, Thirty-ninth Massachusetts Volunteers, at Doctor Bryant’s. The officers complain that on other occasions when the rebels have been seen about there that he is very uncommunicative and they are suspicious of him. As this safeguard is outside of our picket-line nearly a quarter of a mile, I respectfully submit that he should either be withdrawn or relived. Our line is so thin that it is impossible to keep out determined and skillful scouts, and I think in places through the woods on the Lawyers’ road that a wire could be stretched from tree to tree, running through small iron staples, so that the picket could hear any one striking the wire during the night. There must be old worn-out telegraph wire about which could be used advantageously. I have directed Major Stratton to endeavor to entrap the parties who come near Doctor Bryant’s. If you have any other sources to which add to the information compiled here, please contact us.